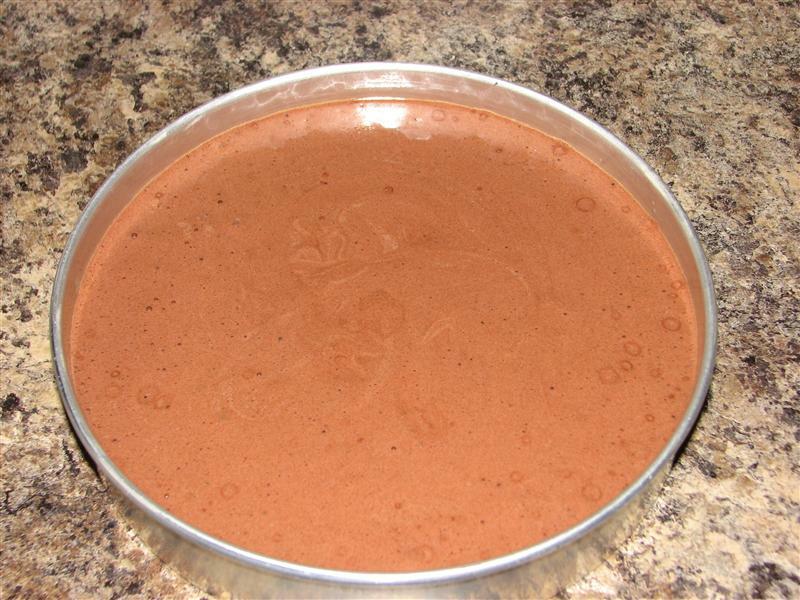 You start by mixing boiling water with your cocoa and vanilla, then setting it aside to cool a bit. Melt your clarified butter (mine was pulled out of the freezer), and cover it and keep it warm. Mix the eggs and sugar, then heat them over simmering water, to barely warm to the touch. Whip for 5 minutes, or until they magically transform into a light, billowy foam. 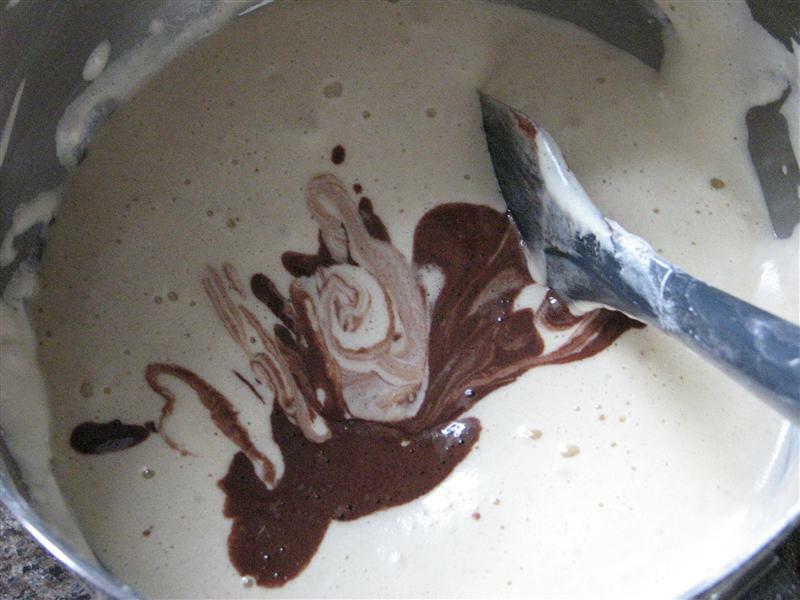 Mix 2 cups or so of the egg foam with the cooled chocolate mixture. 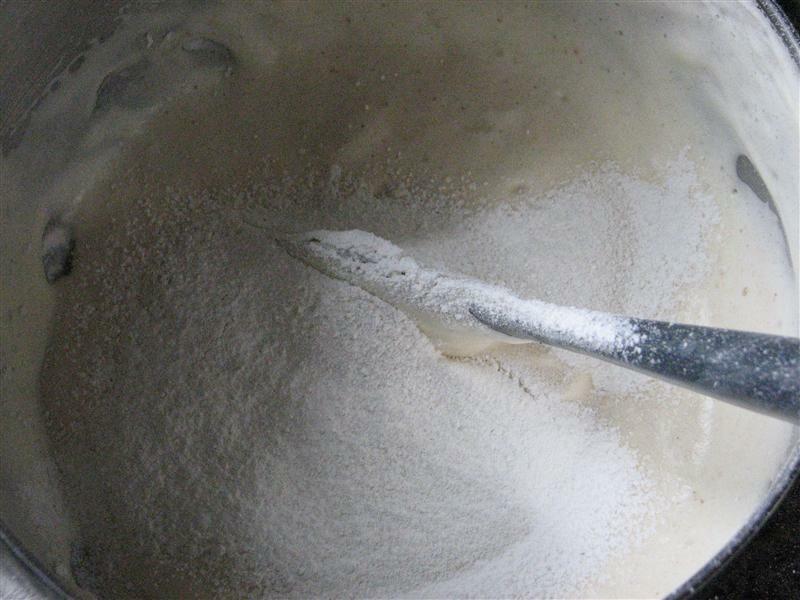 Sift the flour over the rest of the eggs, in two additions, folding it in as you go. After baking, you remove it from the pan, and flip it back right side up immediately to avoid collapse. The ganache and syrup were pretty straightforward. 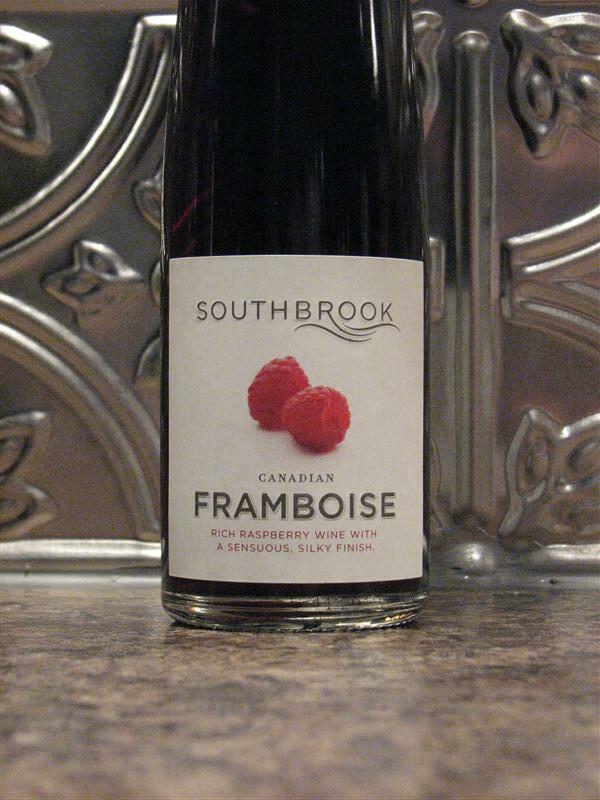 The syrup is a combination of sugar, water, and the framboise I showed above. The ganache is melted chocolate, with peanut butter whisked in, then cold whipping cream added, and the works are whisked until you get soft peaks. If I remember correctly, it was in the marriage vows that my husband gets first dibs on anything containing peanut butter, so he took this one into work today. I’m told he made an executive decision and stashed a couple of pieces in hiding. He left me a ‘tiny sliver’ (his words) when he helped himself to some dessert after dinner while I was on the treadmill. The “tiny sliver” (a reasonable portion, if I’m honest) was delicious. I think I’ll definitely put both the cake part and the peanut butter whipped ganache on my list of favourites, though I’m not sure whether I’ll combine them with the berry syrup again. Maybe a banana liqueur, and make it an Elvis special? 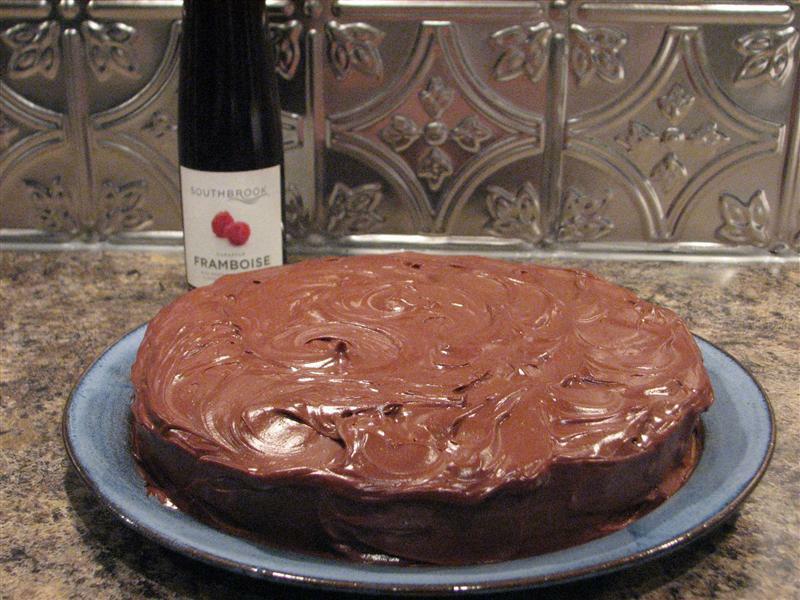 Posted on November 22, 2010 by KristinaPosted in BakingTagged chocolate, framboise, ganache, heavenly cakes, peanut butter, raspberry..
Elvis special actually sounds quite good! “it was in the marriage vows that my husband gets first dibs on anything containing peanut butter” – awesome LOL. Glad you hear you guys like this as well. This seems to be a hit with everyone – I don’t think I’ve read anyone not liking it. That bottle of frambois looks yummy! Beautiful cake! I had the same problem with the flour particles on the bottom of the cake, but I also just picked them out before icing it. I love the idea of banana, peanut butter, and chocolate! an elvis special is a great idea! i’ve been using the KA whisk beater lately for folding and i didn’t get any flour particles in this cake; try it next time! 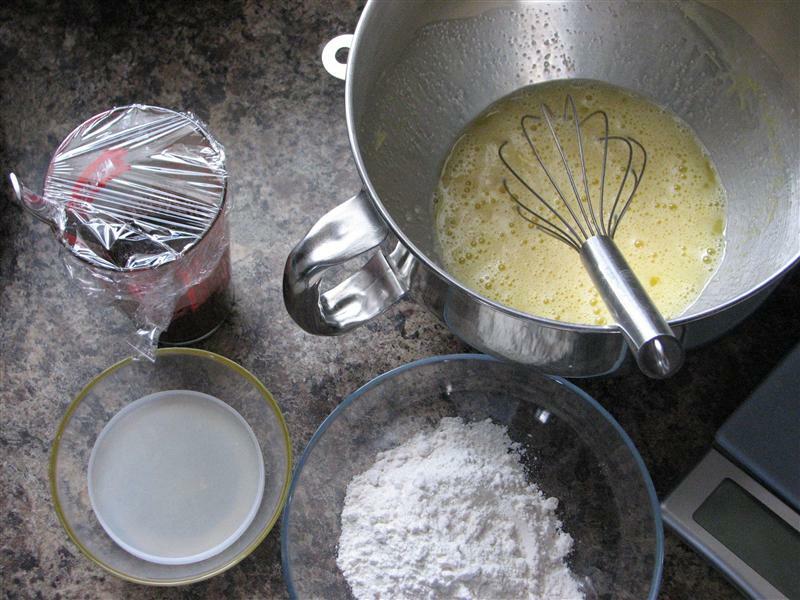 Evil Cake Lady (I love that name), I’ve used the whisk attachment in the past for manual whisking, but I’m not sure I’ve tried it on a genoise, so thanks for the tip, I’ll try that next time! I really think I’m going to have to try the Elvis special, soon. I’m sad I didn’t think of it until after I made it with raspberry!